This is the other side I chose for our holiday dinner from Gina's Skinny Taste. I have decided that pretty much anything roasted is going to be delicious :-), and these were too! Much, much better than the typical green bean casserole in my book, but I've never really liked it to be anyway (shhh). 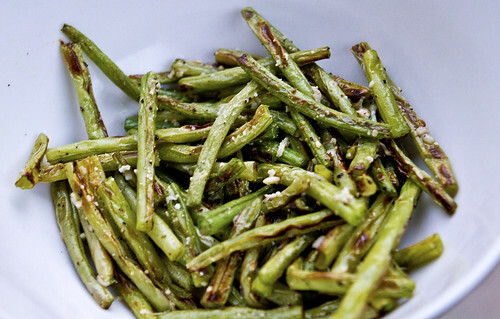 Lay green beans out on the baking sheet and drizzle oil over them. Season with salt, pepper and garlic powder and toss to evenly coat.